Our regional headquarters, which also happens to be our corporate headquarters, is located at One M&T Plaza, Buffalo, N.Y. Locally, our customers bank with us at 77 offices across eight counties, including: Allegany, Cattaraugus, Chautauqua, Erie, Genesee, Niagara, Orleans and Wyoming County. 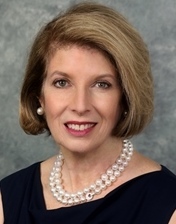 Shelley Drake is a Senior Vice President and Western New York Regional President at M&T Bank, as well as the Chair and President of the M&T Charitable Foundation. Drake has more than 48 years of experience at M&T Bank. Before being named Regional President, she managed a group of relationship managers in the Western New York Commercial Banking Department. A native Buffalonian, Drake has been actively involved in the WNY community for decades, including chairing the Board of Trustees at Buffalo Seminary, the Board of Regents at Canisius College and the Sister’s Hospital Foundation Board. She’s also a past board member of Maria M. Love Convalescent Fund, Bornhava, Ronald McDonald House and Catholic Health Systems. Currently, Drake serves on the boards of the Burchfield Penney Art Center, the Foundation for Jewish Philanthropies and Great Lakes Health System of Western New York.